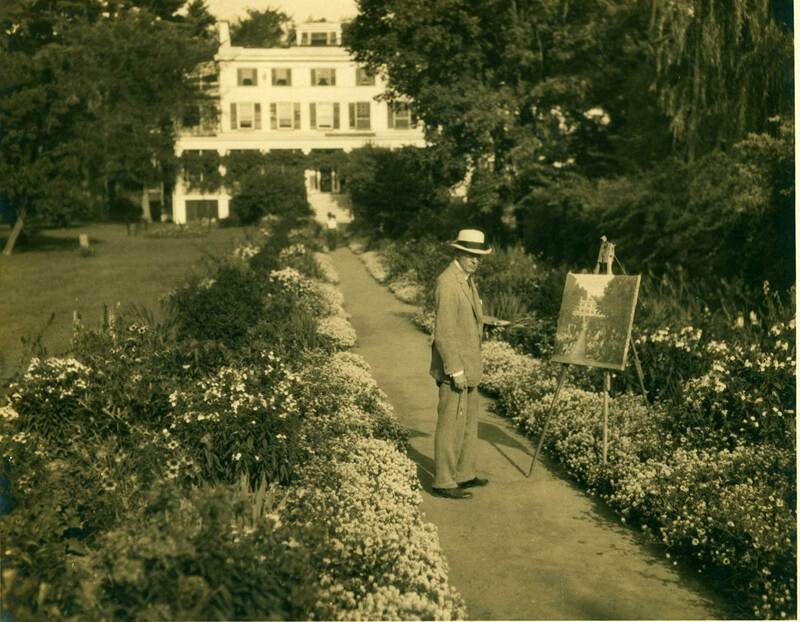 The dazzling displays of Old Lyme’s gardens have captured the eye of painters and photographers for more than a century. 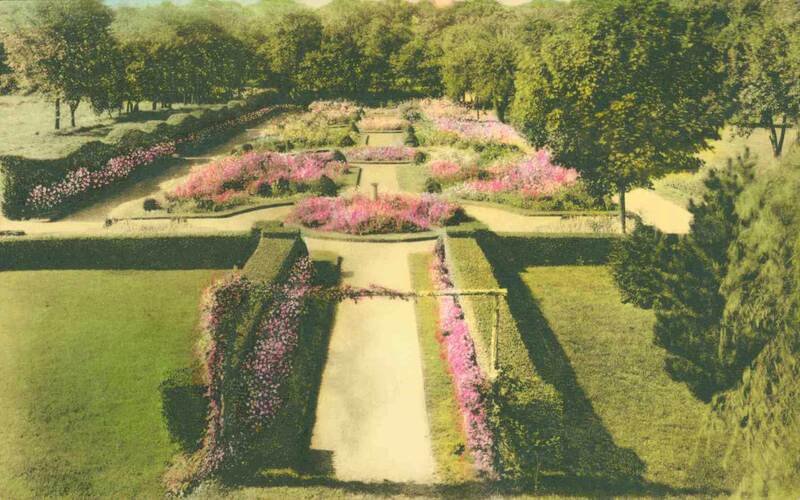 Beside village lanes and riverbanks, in formal designs and in cultivated wildness, blossoming gardens brought swaths of color to hotel grounds, country estates, and artists’ dooryards. 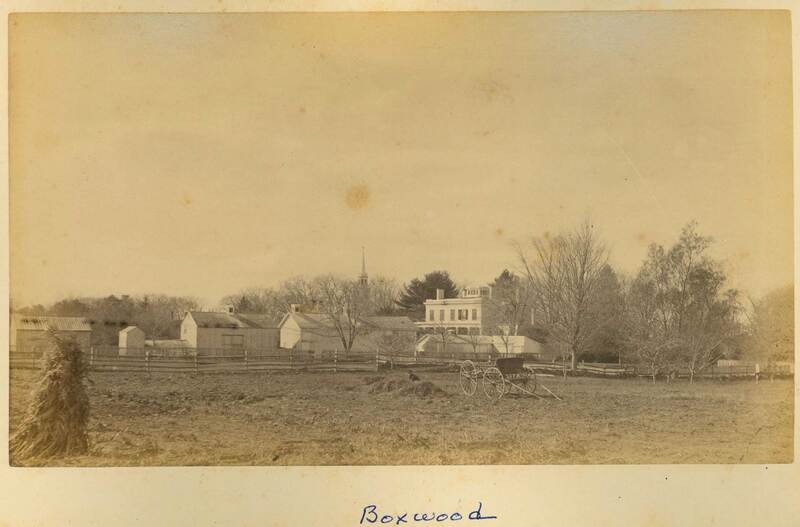 Postcard views of the flowerbeds, hedgerows, rock walls, and fruit trees at Boxwood Manor became almost a signature image of the town’s scenic beauty in the 1930s. 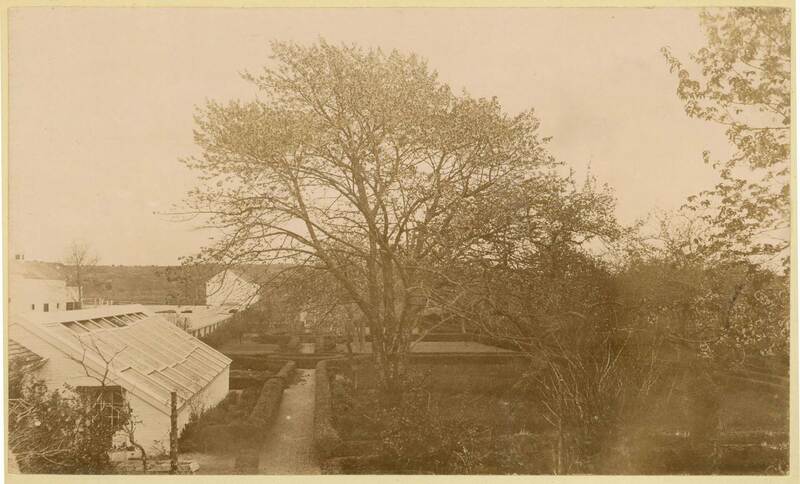 The boxwood gardens behind the Lyme Street estate of Richard Sill Griswold, Jr., (1845–1904) were well established by 1887 when Old Gardens of Connecticut included a scale drawing “showing the exact location of every cherry tree and shrub and hedge. Even the great goldfish pool was shown with the flagstone base forty feet square and its eight foot or twelve foot pool.” The scale drawing has not been found, but glimpses of the gardens and grounds appear in early photographs. 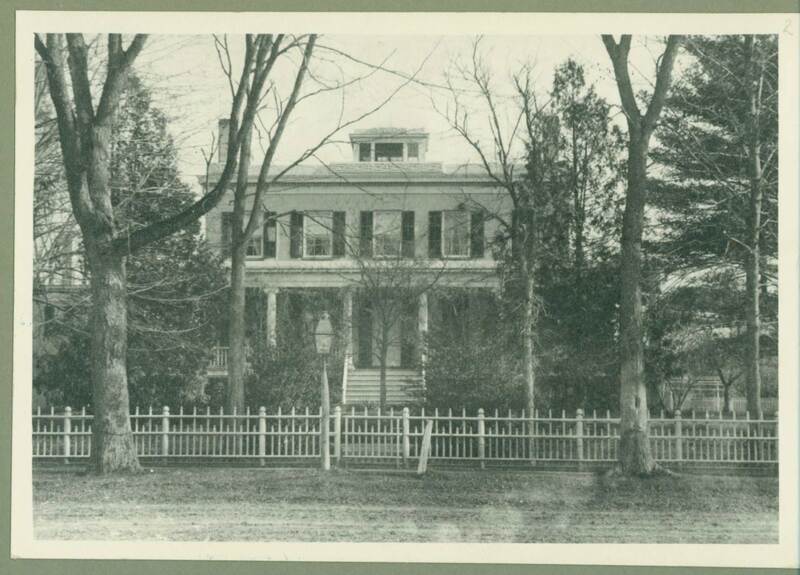 When Richard Griswold retired from the brass manufacturing business in Waterbury and returned to Old Lyme, he expanded the mansion house built for his father in 1840. 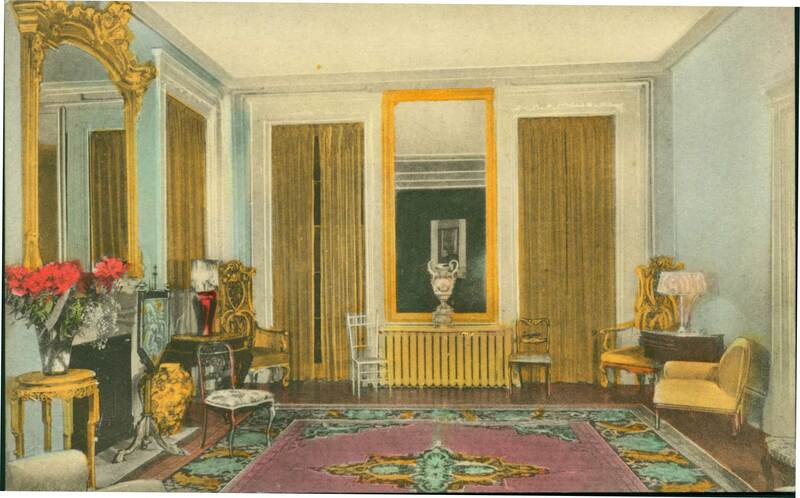 Besides adding a third story, enlarging the north wing, and installing his gardens, he also set up a “photography room” furnished with a double mahogany table, a day bed, and a decorative chair on a carpeted platform for portrait sittings. Over the next two decades, using the cameras, backdrops, lighting equipment, and drying rack in his home studio, he created an extraordinary visual record of Old Lyme’s buildings and surroundings. Skilled at both architectural and portrait photography, Mr. Griswold preserved multiple images of the interior and exterior of his home, his farm at Tantummahaeg, his eight children at various ages and in different poses, the students at the fashionable Boxwood School for Girls opened by his wife in 1890, and even his collection of model sailboats. But rarely did he focus his lens on details of the natural landscape. 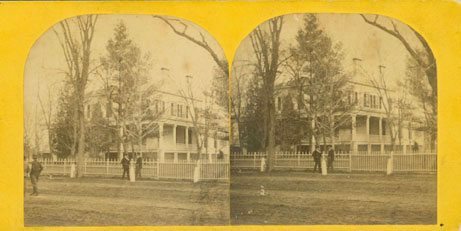 Repeated street views of his house show the front trees and shrubbery, but only two images record the rear grounds of the 25-acre estate. One image looks across the fields to his barns and locates the graceful church steeple prominently in the distance. Another looks beyond the greenhouse and through the apple trees to the elegant formal patterning of the boxwood-bordered paths. But it was structures and people, not plantings, that drew his eye. 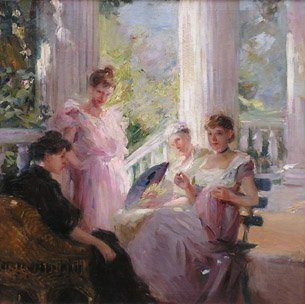 The vine-draped veranda that later became a favorite subject for Lyme artists is scarcely visible in a portrait of Boxwood School students seated on the steps. Boxwood played an important supporting role in the development of the Lyme art colony, and already in 1896 Mrs. Richard Griswold (1849–1907) advertised the Boxwood School for Girls as offering “Special advantages in music and art.” The arrival of the Art Students League’s summer school in 1902, which brought the town “a new title to distinction” according to The New London Day, established an ongoing link between “beautiful ‘Boxwood Hall,’ half hidden behind evergreen hedges and great old trees,” and the artists who visited in growing numbers. 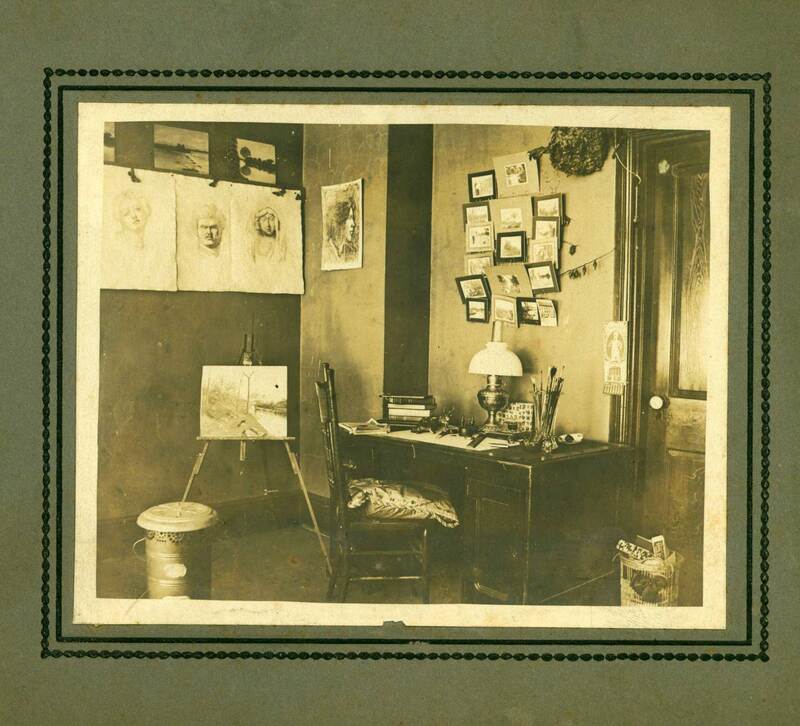 What became known as the summer Lyme School of Art held studio classes in 1905 at Boxwood, where artists could rent rooms when the boarding students were not in residence. 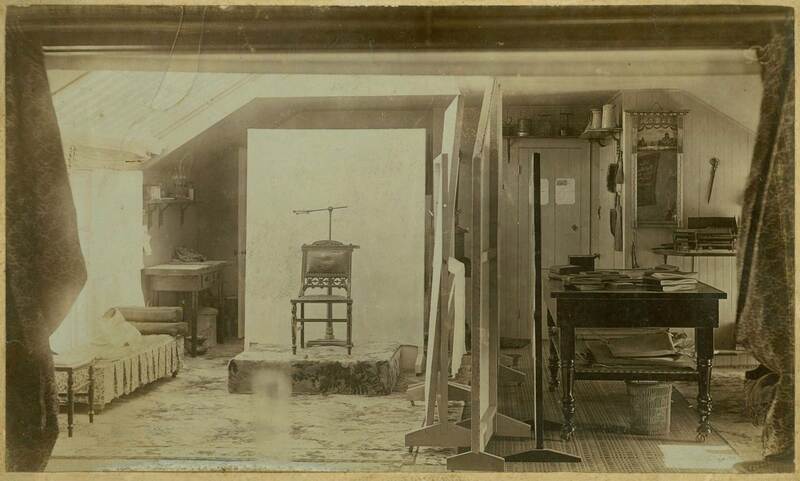 The art colony’s founders had settled in the stately home nearby where Florence Griswold (1850–1937), a cousin, encouraged and promoted their work, but several prominent painters rented rooms at Boxwood. William S. Robinson (1861–1945) and Charles Vezin (1858–1942) who arrived in Lyme in 1905 were among its lodgers, as was Ellen Axson Wilson (1860–1914). 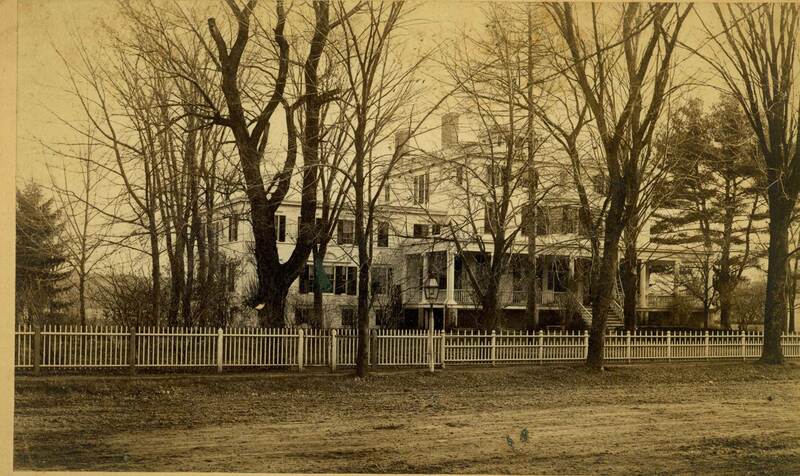 During her family’s first stay in Lyme that year, Woodrow Wilson (1856–1924), then president of Princeton University, booked room and board at Boxwood for the three-month season while his wife enrolled in the summer art school. By then the columned Boxwood veranda had become a favorite subject for Lyme artists. 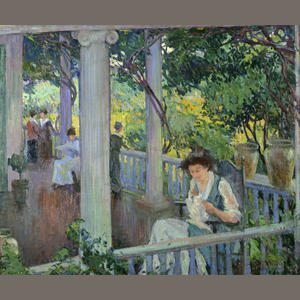 Mary Bradish Titcomb (1856–1927), who had recently studied in Paris and Philadelphia, spent the summer of 1905 in town, perhaps living at Boxwood where she painted two views of the veranda. 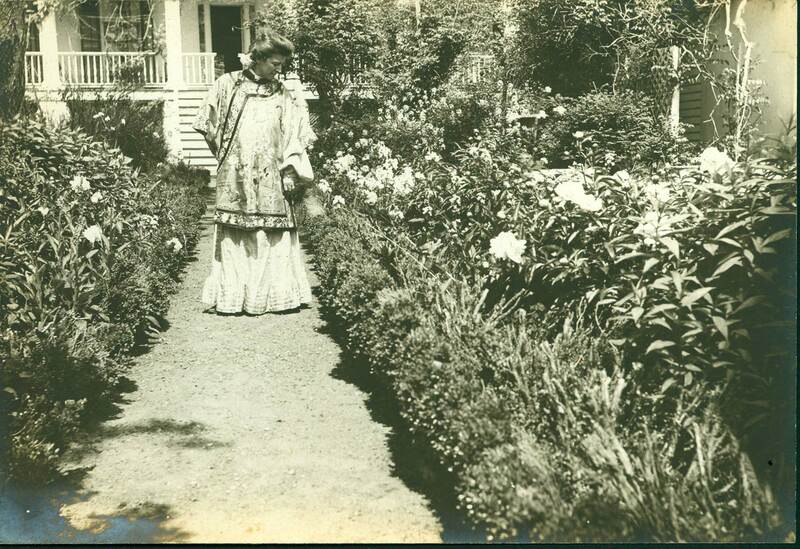 The twelfth summer art exhibition held at the town’s public library included The Veranda: Boxwood Manor in 1913. 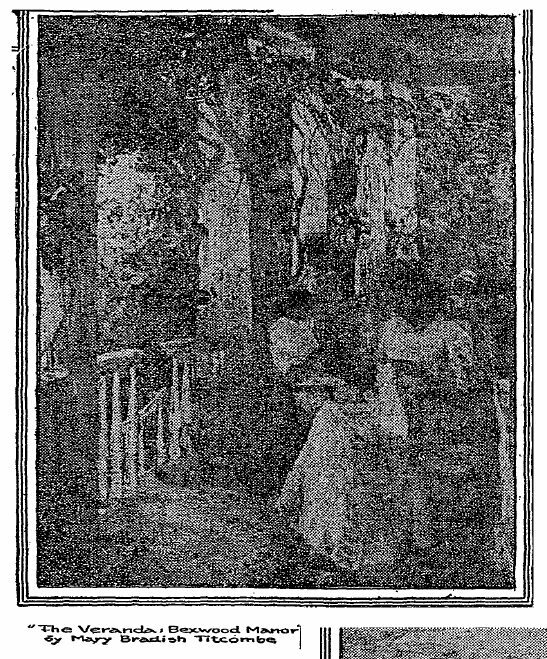 The New York Times’ reviewer praised Titcomb’s skill and described her entry as “a clever painting of light splashed by shadow, and the group of girls sewing and reading are bathed in the warm half light of a place only partly sheltered from the sun’s intrusion.” In a second view of the veranda, which later acquired the misleading title The Park Bench, Titcomb captured a scattering of women guests, perhaps summer art students, sewing, reading, and conversing undisturbed in the vine-shaded enclosure of the porch. Mary Bradish Titcomb, The Park Bench. 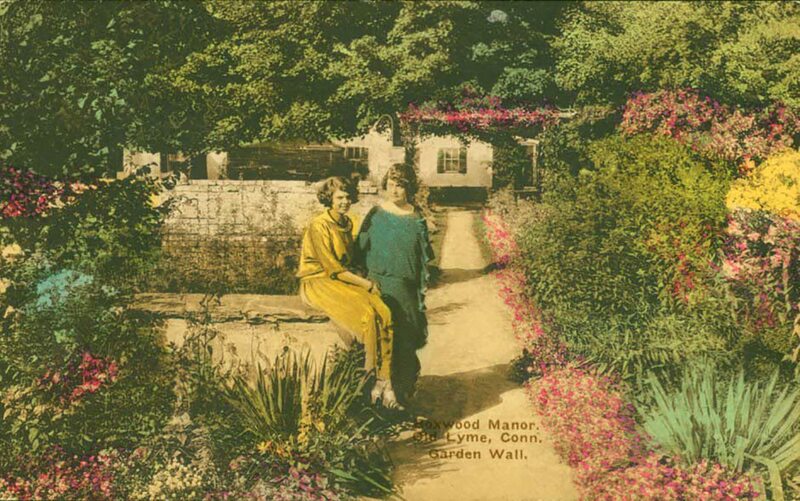 The inn and its summer residents disappeared entirely from Edmund Greacen’s (1877–1949) Boxwood Manor, likely painted in 1910 when he started working in Lyme. 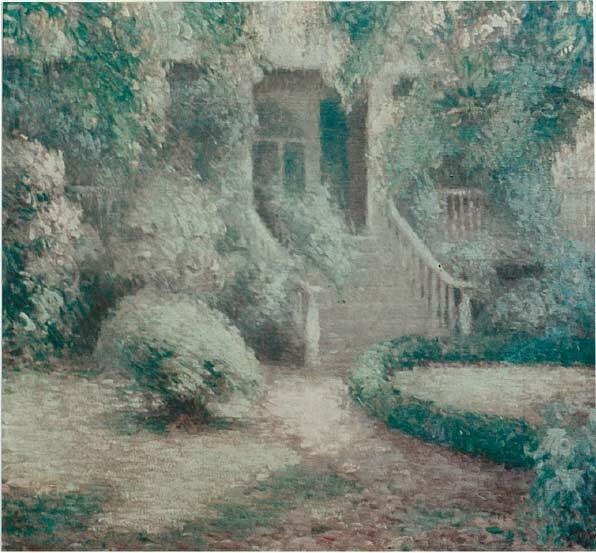 Already recognized for his paintings of the floral landscape in France, where he had rented a house for two years near Monet’s gardens in Giverny, Greacen captured the veranda’s luxuriant foliage in silvery tones of green, pink, cream, and gray. Allowing the cascading leaves and blossoms surrounding the stairway to fill the canvas, Graecen created an alluring portrait of Boxwood’s rear entryway. 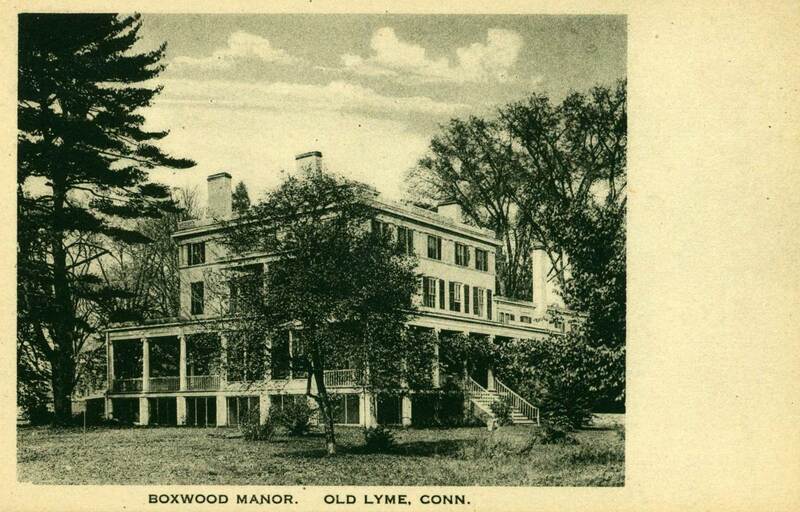 Lyme artists continued to lodge, teach, and paint at Boxwood during its years as a fashionable country inn. 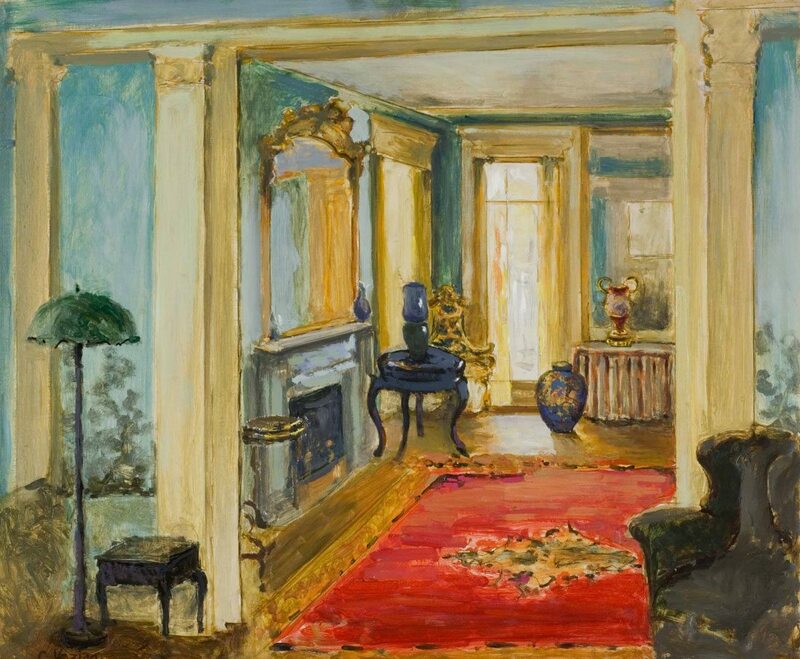 Guy Wiggins (1883–1962) offered painting classes and gave studio talks there during two summers, and Charles Vezin rented Boxwood rooms even after buying a 300-acre farm on Grassy Hill. 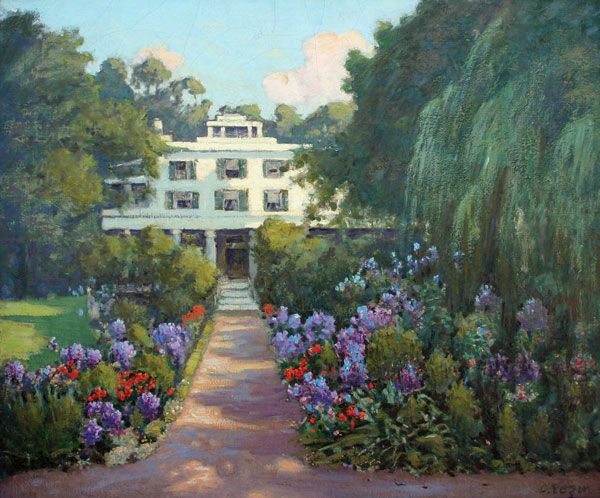 When Charles Vezin painted Gardens at Boxwood in about 1927, he chose not the intimate space of the secluded veranda but the broad sweep of the rear grounds in the fullness of summer bloom. Adopting vibrant primary colors rather than the muted tones favored in earlier views, he used the inn’s bright white façade, sharply delineated, as a backdrop for the crimson and purple display of the central flower-bordered path. Vibrant color also defines Vezin’s interior view of a graciously furnished Boxwood salon. In his impression of The Music Room, the rich red tones of a decorative carpet convey an aura of warmth, elegance, and refinement. The painting also suggests a lasting affection for the historic estate where Lyme artists had painted for more than twenty years. Charles Vezin, The Music Room. 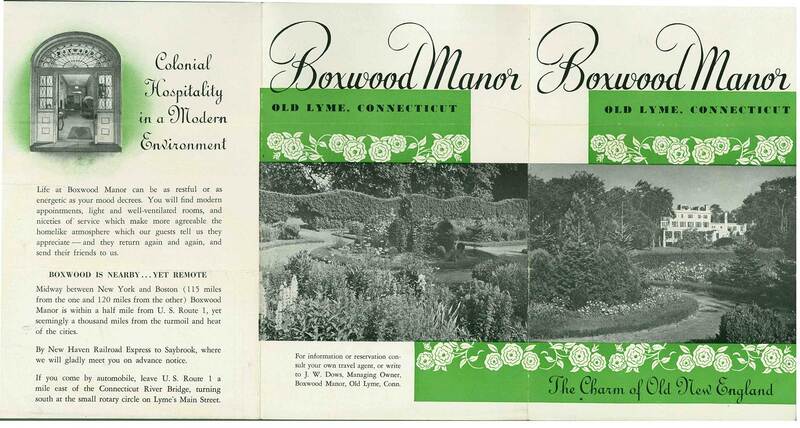 But it was postcard views of Boxwood blossoming that announced Lyme’s scenic beauty to a broader audience. 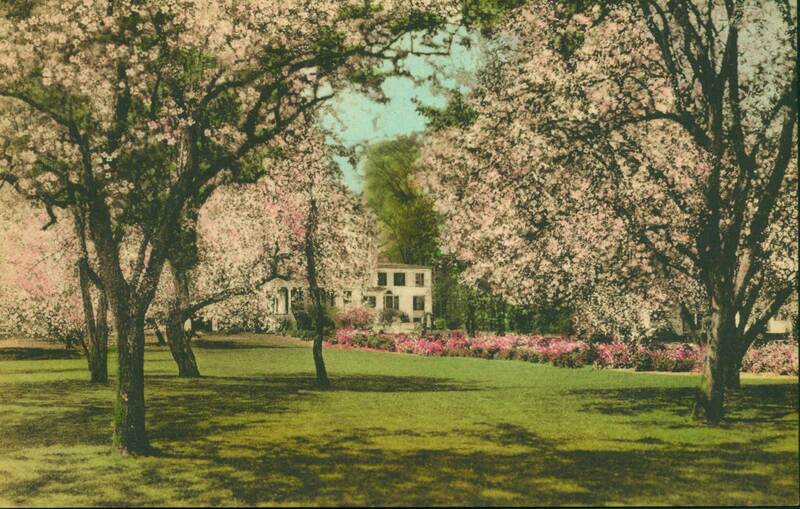 In the 1930s and 1940s guests sent colorful postcard greetings that publicized the charm of the country inn and displayed its resplendent gardens from multiple angles. Mr. Griswold would perhaps have been startled to see the alterations to his grounds, with his distinctive goldfish pool removed, his cornfields dotted with tennis courts and cottages, and his original boxwood gardens lavishly enhanced by flowerbeds, trellises, and rock walls. Mr. Griswold distributed his photography equipment in his will. Old Lyme Probate Records, 5:153, July 6, 1904. The North American Review (1896), p. 772. “Woodrow and Ellen Axson Wilson in Old Lyme: Online Learning Site,” Florence Griswold Museum, 2012. 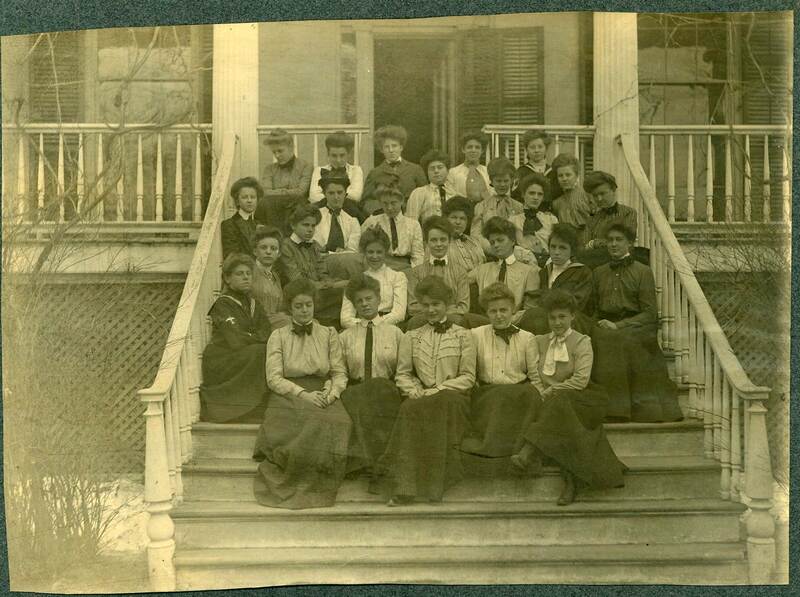 Alumnae Record of Boxwood School (1913). LHSA. “Boxwood’s First Annual Week-End,” The New London Day, June 5, 1912. “Art at Home and Abroad,” The New York Times, September 7, 1913. 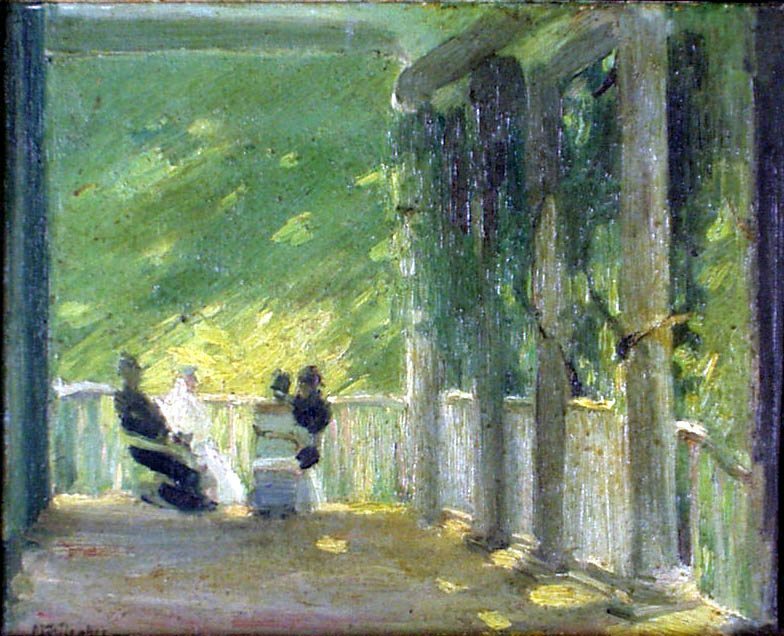 Morning at Boxwood, which Titcomb exhibited in 1911 at the Pennsylvania Museum of Fine Arts, may be the original title of the painting later mistakenly called The Park Bench. The Internet Antique Gazette describes Titcomb’s Old Lyme paintings. Margaret Axson Elliott to Jessie Wilson Sayre, July 5, 1906, in Jessie Wilson Sayre Papers, MC216, Box 1, Public Policy Papers, Department of Rare Books and Special Collections, Princeton University Library; Barbara Lehman Smith, Elizabeth Sparhawk-Jones: The Artist Who Lived Twice (2010), p. 65. Elizabeth Knudsen to Mr. Becker, March 12, 2001, LHSA; W. A. Cushing to Edmund Greacen, May 6, 1913, LHSA. Arts & Decoration, Vol. 8, page 287 (1917); The International Studio, Vol. 64, page 152 (June, 1918).